Jose Mourinho may find Manchester a little more to his liking the next time he steps out of his city centre hotel and strolls around his new home. Having described life in Manchester as a ‘disaster’ earlier this week, it might just feel a little more like home after Juan Mata’s goal secured derby victory over Manchester City and gave Mourinho the edge over Pep Guardiola. Three days after being humbled on his return to Chelsea in a 4-0 hammering, Mourinho reclaimed his pride, and United theirs, by claiming victory in this hard-fought EFL Cup fourth round tie at Old Trafford. United, the better side, deserved their win, which leaves Guardiola in new territory having now gone six games without victory as a manager for the first time. Mourinho, chastened by Sunday’s humiliation at Stamford Bridge, used his programme notes to apologise to the United supporters for the defeat against Chelsea, but the Portuguese knew that the only way to truly make amends would be to deliver a positive performance against City. Little has gone right for United since last month’s derby defeat against Guardiola’s team ended their 100 per cent start to the season and injected doubt into the heads of the players and manager. The form has evaporated, injuries have begun to mount and Mourinho has begun to look old and out of time on the touchline. But form can flip in an instant and the morale boost of victory in this game, for both sides, would have a transformative effect following an indifferent run. City’s own run of no wins in six has been tempered by the fact that Guardiola’s team remain at the top of the Premier League, so their slump can barely be described as a crisis. The recent runs of both teams were evident during a scrappy first-half, however. Neither team was able to dominate possession and chances were few and far between after Kelechi Iheanacho headed a Jesus Navas cross over from two yards in the second minute. Guardiola’s team should have been awarded a penalty eight minutes later when Michael Carrick tripped teenager Alex Garcia – who was outstanding along with 19-year-old City full-back Pablo Maffeo – in the eighteen-yard box. Referee Mike Dean dismissed City’s appeals, though, and United survived to avoid suffering their latest early setback in a game. But with Zlatan Ibrahimovic once again leading the line, United lacked pace and movement up front and their approach play was predictable, with everything played wide rather than through the middle. 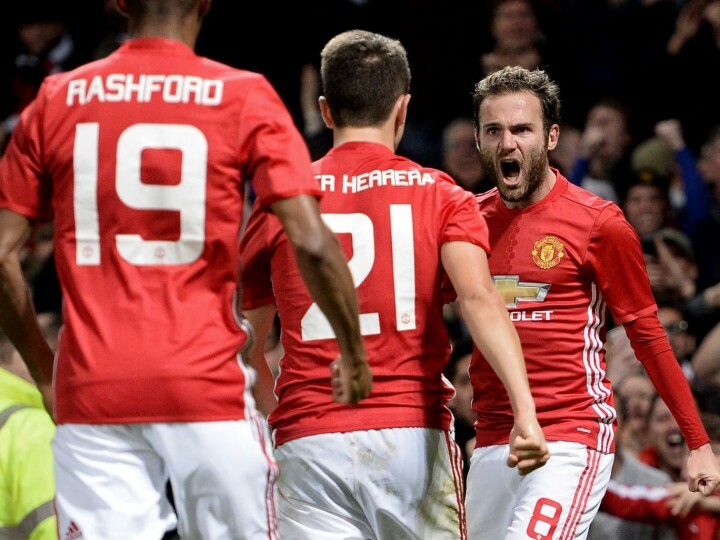 Maffeo was containing Marcus Rashford on United’s left flank and Juan Mata was offering little down the right. As for Paul Pogba, the £89m midfielder was anonymous once again. United had to wait until the 37th minute before they created a clear chance, but Maffeo reacted brilliantly to block Rashford’s shot after the England youngster had raced onto Ibrahimovic’s pass. City responded, with Iheanacho breaking forward seconds later, but this time, Marcos Rojo produced the crucial block to keep the scoreline at 0-0. As the home team, United had not done enough to trouble City in the first-half, but the half-time instruction from Mourinho appeared to have been for his players to step up the tempo and be bolder against their opponents. Rashford, so quiet in the first-half, began to run at Maffeo and his pace enabled the United forward to carve out a chance for Pogba, only for the Frenchman to curl an effort wide from 20 yards. Pogba had gone close to opening the scoring seconds earlier after being freed by Ibrahimovic cleverly weighted pass outside the penalty area. Having allowed the ball to run across him, Pogba aimed a left foot shot at goal, but goalkeeper Willy Caballero pushed it onto the post to deny United. City, having lost captain Vincent Kompany at half-time, lacked their first-half assurance at the back and United continued to pour forward. And the absence of the Belgian centre-half told on 54 minutes when Mata was allowed to pounce on a loose ball to break the deadlock. Ibrahimovic was the creator once again, having outmuscled Nicolas Otamendi to break into the penalty area. The Swede then played the ball inside, Ander Herrera and Fernando collided while attempting to reach it, but Mata ghosted in unmarked to guide a left foot shot into the net from six yards. United now had to decide whether to stick or twist – hold out for the 1-0 victory or push for the second to kill the game. Few Mourinho teams have ever played cavalier football simply to entertain the supporters, but United attempted to strike a balance between shutting the door at the back and slamming it in City’s face further forward. Ibrahimovic began to show his experience, holding the ball, using his head and instilling calm at key moments. Michael Carrick, another seasoned performer, also gave Mourinho further evidence of his worth to the team having been overlooked so often this season. Guardiola, aiming to avoid another defeat, threw on Raheem Sterling and Sergio Aguero in an attempt to chase the game, but it failed to pay off. United held firm and Guardiola’s winless run goes on.